Once a middle-class job, many college and university faculty are now working part time for poverty-level pay, isolated from colleagues without job security, benefits or even office space. Even tenure and tenure track professors struggle with the impacts of funding cuts and decreased faculty input. Students are increasingly saddled with crushing debt that could take a lifetime to get out from under. Parents are struggling to stay afloat in the face of skyrocketing tuition bills. As faculty, we have the power to help reverse these trends. That’s why we’re coming together to form unions, build our collective political power and demand the funding students and faculty need so that we can fix the broken higher education system. Already, 54,000 faculty and graduate student workers on 60 campuses have joined the Faculty Forward movement and formed unions. By joining together to form a union, we’ve improved our jobs. 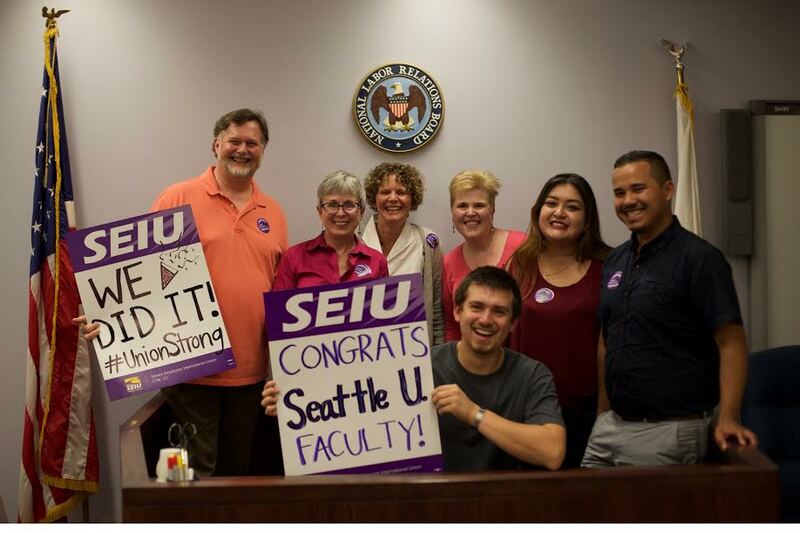 Sixty percent of SEIU Faculty Forward first contracts include pay raises of at least 20 percent for the lowest paid faculty and 40 percent of contracts have pay raises of 30 percent or more for the lowest paid. More than 70 percent of these first contracts include professional development programs worth more than three quarters of a million dollars. On top of these school-by-school wins, we’re also fighting for systemic change. In Massachusetts, we supported legislation that would provide pay parity for adjuncts. In Florida, we’re fighting for adequate funding. Nationally, we support Senator Durbin’s bill to extend student debt forgiveness to adjuncts, have fought for debt-free college for all, stood up for our immigrant brothers and sisters on campus and helped win the fight against provisions in the tax bill that targeted students. You can read more about why we need to unite for change here and what we’ve won here.